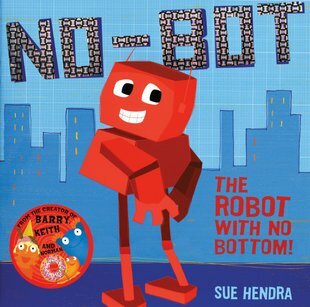 All reviews for No-Bot, The Robot With No Bottom! No-Bot goes to the park and goes on the swing,but when he walks a little to go home he finds out he lost his bottom. now he is No-Bot, The Robot With No Bottom!where could his bottom be…. read on to find out what happened to his bottom!!!!! My favourite picture is the second to last picture because it shows his arm has come of and attached to the swing right acts he said he won’t lose anything again. Also you can imagine what happens next. My favourite character is the robot because he is funny and forgetful, his forgetfulness caused some funny antics and that’s what every book needs. I rate this book 9/10 it was a brilliant book!